How to get to Sprockids Bike Park: When you arrive on the Sunshine Coast from the Lower Mainland Langdale will be your starting point because this is where the ferry docks. When you come off the ferry if you go straight through the lights and up the hill you will come to a blinking light at the top. This is Stewart Rd and if you turn left you will continue on to Gibsons and if you turn right you will be at the bike park. For those of you coming from up coast you will take Hwy. 101 to Gibsons and turn left onto North Rd. Follow it along for a couple kilometres to Stewart Rd and turn left again, through the blinking light to the park. The yellow gate is usually closed on the left so turn to your right and park. You can actually get into the park just a little further along that road on your left via the access trail to the blue, yellow and white trails or you can head up the gated road and into the park that way. Sprockids Bike Park is a Sunshine Coast Regional District park. However, most of the trails here were built and are maintained by the local Sprockids organization. Also, students from Capilano University’s Mountain Bike Operations Program worked on trail projects here as part of the Park and Trail Design and Building courses. In 2007 they built Skoolz Out and this April 2011 they finished Fuzzy Hugs. Anklebiter starts just off the entrance road, immediately on the left as you pass the last yellow gate into the park. Although this trail is rated Intermediate, it is definitely on the easy end of that spectrum. Not nearly as much hill as many of the other trails in the park and few if any technical features, this is a good trail for beginners or less skilled riders (like me!). One of the easier trails in Sprockids Bike Park. It connects with Stinger. This trail is a bit scary in places (mostly if you are on your bike). Going up is very steep, so if you are riding you will almost definitely be pushing your bike. There are places where the trail drops off very steeply on your right as you climb and on your left if you are riding down. Very steep and quite dangerous particularly if you are on a bike. If you aren't very skilled, please don't ride this trail. The piece of the trail that climbs up from the Langdale Falls viewpoint is even steeper and more of a deer trail. Having said all of this, my opinion is that this is a better hiking trail than biking. Although the climb is steep, the view of the falls is quite lovely. This makes a nice 40 to 60 minute hike from the entrance in and then back. A short short and steep DH trail built by the Capilano University Mountain Bike students in 2009 with the help and guidance of instructors Mark Schmidt and Jay Hoots. This trail branches off of Sidewinder midway and features some steep tight rock armoured corners before ending with a bridge and skinny feature. This trail leads into either Mr. Smiley or Mrs. Pickle. Another classic Sprockids trail, Corkscrew starts at the old trail map / backboard intersection and descends via a series of banked turns down to the Skills Area. Branching off the main road inside Sprockids, this trail offers users a way to access Pineapple Express and Lower Flume. Caution is advised when riding / hiking this trail as sight lines are poor. This downhill trail, named in honour of Sprockids founder Doug Detwiller, is being incrementally built by the Capilano University students in the spring of every year since 2012 under the guidance of instructors Jay Hoots and Daniel Scott. It currently enters off of lower Sidewinder beside Upper Flume and is a funtastic mixture of flow and tech mountain bike features. Countless rollers, berms, log rides, and ladder bridges are mixed in between a few larger step-down drops and cannons. Caution is advised when exiting the trail onto Lower Flume as this can be a high traffic area. Entrance into the East side of Sprockids Bike Park. Takes you over to Lunge, blue, white and yellow trails. Wide, easy trail. Flume is a short trail that connects between the White trail and Sidewinder. A little rough in places, but not too technical. Named after the old flume that used to run down to Langdale through here. Newest trail in Sprockids Bike Park - just built in April 2011 by the Capilano University Mountain Bike students. The students, with the help and guidance of instructors Jay Hoots and Daniel Scott, built this approximately 600 metre trail in just two weeks. It branches off Ridge and Sidewinder with a very steep, switchback section at the top, a cool wooden wall and several other wooden technical features on the way down. Check out this video taken by student Jamie Koth. A short, very steep trail that takes you down to Langdale Creek, over a bridge, back up the trail and out of the Sprockids Bike Park to the powerlines. There are a couple of spots where the trail is a bit scary because of a steep drop off. A short downhill flow trail named in honour of a local trail builder’s iconic signature smiley faces that they carved into features with a chainsaw along all their trails. This trail was built by the Capilano University Mountain Bike students in 2009 with the help and guidance of instructors Mark Schmidt and Jay Hoots and features a wooden step-down, wall ride and a cannon drop. A short downhill flow trail that branches off of lower Sidewinder and features a series of bermed corners, rollers and rock gardens. This trail was built by the Capilano University Mountain Bike students in 2009 with the help and guidance of instructors Mark Schmidt and Jay Hoots. Orange trail connects the White trail and the Sechelt-Roberts Forest Service Road aka Wicked Ditches. It is very rough and in bad need of repair as of May 2011. Even the Forest Service Road/Wicked Ditches at that end is overgrown. The first third from Ditches has several trees down and is pretty much impossible to ride without a lot of hefting the bike over logs. Also it is not well marked at that end. Orange markers start showing up about 1/3 or 1/2 of the way to the White trail. An extension of Doug’s Detention, this trail currently starts from the intersection of Lower Flume and Creeker’s Connectors and dumps you out at the lower entrance of the bottom parking lot. Featuring loads of bermed corners, an on-off wall ride, rock gardens and lots of pumping rolling trail this trail is a blast! Crazy downhill. Super steep in places and quite rough. Part of the trail parallels the white trail and part of it is actually on the white trail. Badly in need of repair and cleanup. Red trail connects from Hwy. 102 just past the bridge over Chaster Creek. It is marked with red tree markers and the entrance has a sign that says Tramway Trail. At some time in the past there used to be an old Tram that ran up the hill in this area. This trail is all about the hill and the wooden technical features. Better ridden down than up (for obvious reasons), it connects to the top end of Branch 03 of the Sechelt - Roberts Forest Service Road. There are more bridges, log rides and ramps on this trails than I've seen anywhere else. If you want to ride this trail and you are coming from Sprockids Bike Park, take Hwy. 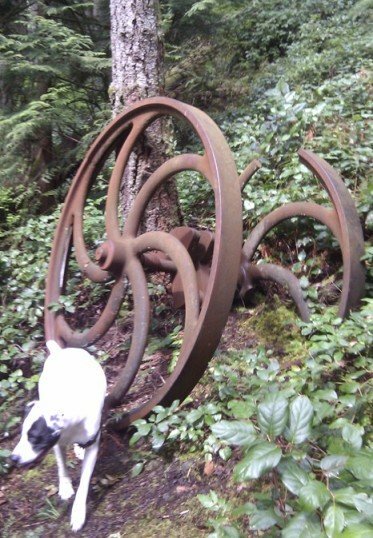 102 over to the Forest Service Road, turn right and follow the road straight up for about a kilometre or more til you get to the trail entrance with the red ribbon and old metal wheel base. See my Hwy. 102 route for more info. 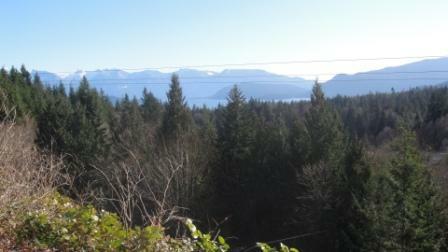 The lower Red trail aka Mount Elphinstone trail runs from Hwy. 102 to the old cemetery. It is extremely steep, but only about a kilometre in distance. Reminded me a bit of the Grouse Grind - it was that steep. Part way up on the left you will notice an old flywheel from a Sawmill that was in the area many years ago. Impossible to ride up, probably a blast to ride down if you are an avid downhiller. Here's another steep, narrow Sprockids Bike Park trail. If you're riding, it's not much fun going up, but great going down. Connects between Torrent and Flume Remains. It really does run along a ridge between two valleys. Pretty cool, but not an easy ride. If you're hiking it's a bit of a climb and coming down can be tough on your knees. This trail takes you up to Technical Ecstasy on the West side of the park. A little bit of a gentler climb compared to many of the trails here and not as technical as some. Sidewinder is quite a long trail that takes you from one side of Sprockids Bike Park, almost all the way over to the other. White trail kind of becomes Sidewinder on the West side just after the intersection for Hwy. 102. (Sidewinder is marked with white markers.) It winds around the side of the hill and crosses the new trail Fuzzy Hugs and several others. From East to West it climbs, but is a gentler climb than many of the other trails so is a good way to get to the West side of the park if you want to avoid a really steep route like White, Ridge, or Torrent. Great, winding, downhill trail with lots of wooden features along the way. Most are built on little side loops so that you can choose to ride them or not, depending on your skill level. This trail was built in 2007 by the Capilano University Mountain Bike students. Lots of fun! Stinger is very much like Anklebiter - maybe just a bit more difficult. It winds around quite a bit, but is not very technical. Not too far in on Anklebiter you will come to a junction with a sign for Stinger. Both Stinger and Anklebiter have connecting trails over to the powerlines on the east side of Stewart Road, above Cemetery Road. Connects between White trail and Sidewinder with lots of technical bits. Not too hilly though. Torrent is about a kilometre long and runs between Ridge and Technical Ecstasy. It is a pretty tough climb up, but an exhilarating ride down a narrow, steep trail. There's a really neat big, old, rotting tree that can be ridden down. Can be a bit slippery and if you're hiking up the trail it might be wise to hike around it. One of the older trails in Sprockids Park that was once a downhill practice trail in the Park! This fast trail dodges and weaves through scrub brush before exiting at the bottom of the Skills Area near Creeker’s Connector. This trail basically takes you all the way around the perimeter of Sprockids Bike Park. It allows you access to Pressure Drop, Wildman, Ridge, Hwy. 102, Sidewinder and others. It's a great trail to take to get your bearings in the park and see where all of the other trails come in and out. It is very steep in places with some roots and rocks. Perfectly named! You'd need to be a wild man to take this trail on your bike. It's even tough to walk it. There are teeter-totters, ramps, logs, etc. Badly in need of repair and cleanup as of May 2011. I would not recommend it as it is. This is a bit confusing because there are actually two yellow trails. You'll come to the first when you enter Sprockids Bike Park on the entrance trail south of the parking area. you will see several different coloured markers on the trees - White, Yellow, Red and Blue. As you travel along the trail you'll leave red and blue behind and just have yellow and white markers left. Yellow will exit to the right on the smaller Wildman trail. This yellow trail will take you over a very long distance to the summit of Mount Elphinstone - probably about a 3 1/2 to 4 1/2 hour hike one way. White will continue straight ahead and will lead you to the second Yellow trail which connects from the White trail to the Sechelt-Roberts Forest Service Road/Wicked Ditches. This trail is in good condition, but as is the case with most trails in Sprockids Bike Park, it climbs quite a bit. If you have any questions about Sprockids Bike Park trails or you just want to share something about these trails, please contact me. Click here to return from Sprockids Bike Park to the Sunshine Coast Trails Home page.